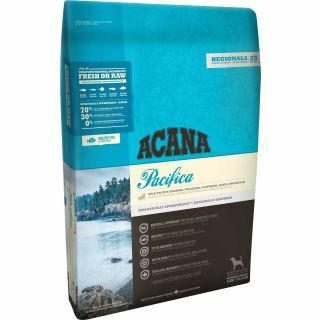 Entirely free of plant protein concentrates, ACANA Pacifica is loaded with 70% fish — up to twice as much as most pet specialty dog foods. 1/2 of the fish in ACANA is FRESH, supplying essential nutrients in their most nourishing form, and 1/2 are dried or oils to provide a concentrated source of nourishing fish protein. ACANA Pacifica features 5 fresh fish. All arrive in WholePrey™ ratios that include meat, organs and cartilage to supply nutrients naturally. 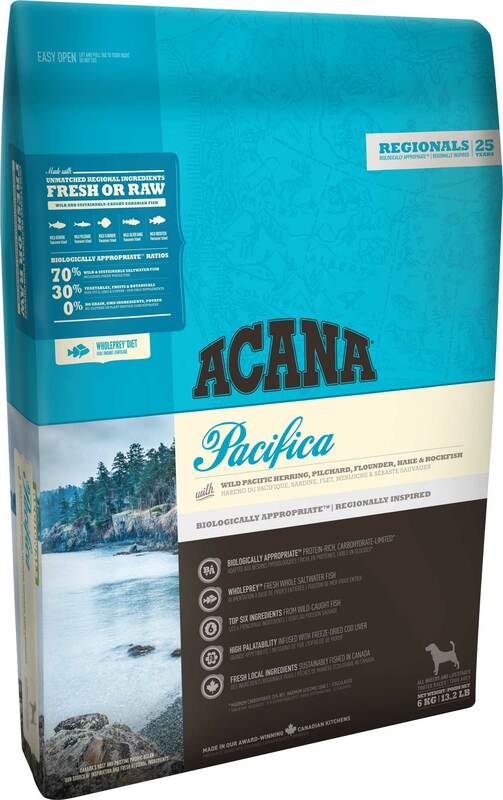 ACANA Pacifica’s rich fish and WholePrey™ inclusions supply nutrients naturally. By providing a concentrated, natural source of virtually every nutrient your dog needs to thrive, you eliminate the need for long lists of synthetic additives which is why Vitamin E, zinc and copper are our only added supplements.